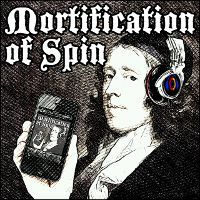 The latest podcast from Mortification of Spin does a good job in explaining Presbyterian/Reformed distinctives on the covenantal nature of children of believers. If you have questions on issues such as infant baptism, give it a listen. 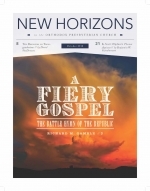 The October 2018 issue of New Horizons magazine (a publication of the Orthodox Presbyterian Church) has an article on “The Battle Hymn of the Republic” and why it is inappropriate for Christian worship. The article is interesting, informative, well-measure, and worth your time to read. It’s been said that the goal of all theological thinking is to distinguish without separating, and to unite without confounding. You can think of how that played out in 451 A.D. in the Council of Chalcedon–to distinguish the human and divine natures of Christ without separating them; to see his two natures united in his one person without being confounded. You can think of how that has played out in the last 500 years in the relationship between justification and sanctification–to distinguish them without separating them, lest it be thought you could be justified without in any way being sanctified; but also to avoid the Roman error of uniting them to the point of confounding them, so that justification becomes sanctification, and sanctification becomes justification. You can think of how this is at the root of all ancient heresies, and even of the heresies of modern Western thought–you can think of the separation of faith and science, not just distinct but now entirely separated. Or the modern way of uniting to the point of confounding–male and female, now seen by our culture as interchangeable. A goal in all theological thinking, though, is to distinguish without separating and to unite without confounding. This distinction of church and home straying into a separation describes the common practice in modern youth ministry, which says, “Leave the spiritual care of your children and youth to us, the professionals. You parents can bring your children and drop them off and let the professionals take care of them for you. You just outsource this task to the church.” And so we’ve built the big youth buildings, we’ve invested in the fancy vans, we’ve made it a lot fun. But the data is now coming back and the data is not encouraging–this separation of the church from the home, and of the home from the church, has resulted in losing a generation. In fact, the data shows that there is no correlation between a young person’s involvement in a youth group and whether he or she continues to walk with the Lord into adulthood. Dr. Jones came down from Louisville and spent a weekend with our church training us in how to have family devotions–or, as he put it, “faith talks.” And before he did that, he conducted a survey of our parents and of our families to find out how many of our families were doing family devotions, how frequently they were doing them. And of those that weren’t, what were their big impediments, what were their barriers that they had to overcome to begin this practice. So when he arrived he had a thirty-page report that was tailor-made for our church. These have been some significant steps we’ve taken at Greenville ARP that have been very exciting and really helpful. We have a long way to go–this is a long process of moving toward what we call a “Family Equipping Ministry” model for the children’s and youth ministry at Greenville ARP. We’re beginning to see some fruit, most of it is like the mustard seed growing into the tree, we won’t see the full fruit of it for a long time to come. But here’s what my prayer has been, and I think a lot of the church shares this prayer. From our group of children and youth, I’d love to see at least one pastor, at least one missionary, and at least one bona fide theologian come from this group who go on to serve the Lord Jesus Christ in these significant ways. But most of all – truly most of all – what I’m hoping is that we see a generation of young men and women, many of whom, maybe most of whom, are called into marriage and into the sacred task of childrearing, who will recognize that this seemingly small, seemingly insignificant task is actually a huge calling on their lives. And my prayer is that they will be practicing family devotions in their home, singing psalms, hymns and spiritual songs in their homes and in their hearts, and when their kids ask them, “Why do we do this?” they will say, “Well, because the Scriptures say that we are to bring you to the Lord, and worship him together, and . . . it’s what my mom and dad did with me. ” That’s our #1 goal. How Shall We Remember God? Last month, our family went on a short vacation to Branson, Missouri. On the way back home, we stopped in the small town of Mansfield, Missouri, because I wanted the girls to see the Laura Ingalls Wilder Home and Museum located there. This is where Laura settled as an adult, and it is where she wrote the famous Little House on the Prairie books during her later years. You can take a tour of her home (in some ways a little house of its own), and the museum contains many interesting items: handwritten manuscripts, an old typewriter (who remembers those things? ), and photographs of her family. The museum even has her father’s old violin (“Pa’s fiddle”), a recurring fixture in many of her books. The website for the museum calls Pa’s fiddle “a kind of time machine.” Why do we hold onto such old things? It is because they remind us of the past. They remind of us the way things used to be. Those memories, whether good or bad, are a part of who we are, and those old things aren’t just pieces of junk in a museum gathering dust – they help connect us to those memories. In the Bible, we are told of the importance of remembering. In the book of Exodus, God hears the groaning of the Israelites and remembers His covenant promises (Exodus 2:24; 6:5). Later, Israel is told, “Remember this day in which you went out from Egypt, from the house of slavery; for by a powerful hand the Lord brought you out from this place” (Exodus 13:3). In the book of Ecclesiastes, we are told to remember our Creator in the days of youth (12:1) and before the day of our death (12:6-7). In the New Testament, Paul tells the Ephesians to remember there was a time when they were separated from God and without hope, but solely by the grace of God they have been brought into fellowship with Him through the blood of the Lord Jesus Christ (Ephesians 2:11-13). Paul exhorts Timothy, “Remember Jesus Christ, risen from the dead, descendant of David, according to my gospel” (2 Timothy 2:8). Notice how the incarnation of our Lord (“descendant of David”) and His resurrection (“risen from the dead”) are both mentioned in a verse about the gospel. It is good to remember these things. But there are also things that God does not remember. We must not think that God’s “remembering” is the same as ours, for God is omniscient and knows all things. His remembering of His covenant promises is a picture drawn for us to know that He is faithful and trustworthy and always keeps His promises to us. God not only remembers His covenant promises – He also “forgets” our sins. Again, this does not mean God is forgetful in the sense that we might forget where we left our car keys or we might forget an important appointment. God’s “forgetfulness” is meant to emphasize the full forgiveness of sins that He offers to us in the gospel of Jesus Christ. “I will forgive their iniquity, and their sin I will remember no more” (Jeremiah 31:34; Hebrews 8:12; 10:17). Last week, we celebrated the sacrament of the Lord’s Supper. Whenever we come to the Lord’s Table, we are called to remember the meal and remember all that the Lord has done for us. He says, “Do this in remembrance of Me” (Luke 22:19; 1 Corinthians 11:24-25). Through this covenant meal, the Lord strengthens our faith. Believers are “by faith, made partakers of His body and blood, with all His benefits, to their spiritual nourishment and growth in grace” (Westminster Shorter Catechism, Q. 96). Pa’s fiddle was a big deal to Laura Ingalls Wilder; the Lord’s Supper should be a much bigger deal for us! God gives us ironclad promises in His word; but He confirms and seals and shows us the truth of those promises through the sacrament of the Lord’s Supper. Here is Christ crucified for us, here is forgiveness, and here is nourishment for our souls. Let us remember these things.